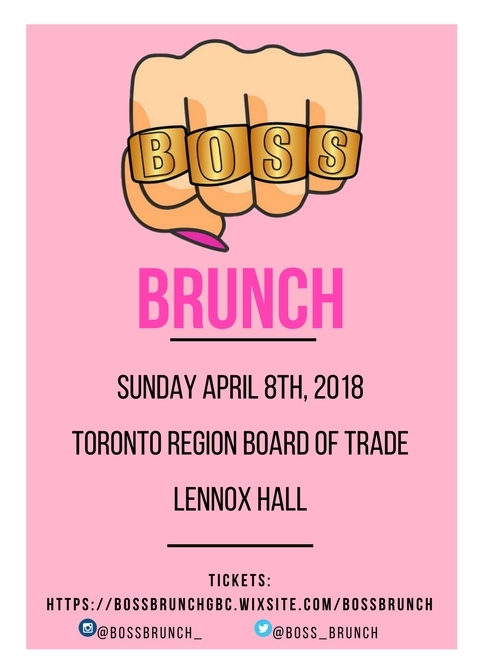 Boss Brunch is a Female-focused networking event, providing a platform for attendees to be interactive with one another by partaking in networking activities, enjoy a three-course plated brunch; catered by Oliver&Bonacini, Mimosas; sponsored by Girls’ Night Out Wines and hear the experiences of successful, Toronto-based, female guest speakers. Keynote speakers and Panelists include; Teresa Resch, Toronto Raptors Vice President, Mala Rambharose, Founder of CityMonk Media, Shannon Simmons, Founder of New School of Finance, Carly Silberstein, CEO of Redstone Agency Inc., Chelsea Spencer, Founder of Empower Athletics &Co., Julia Zeeman, Sustainable Energy Consultant and Evelisa Genova, Artist, Government Relations & Advocacy. Proceeds from ticket sales will be donated to the George Brown College Foundation and Times Change Women’s Employment Service.